I have a DC charger in my caravan, but it doesn’t seem to charge properly? With pretty much all new vehicles these days running smart alternators, the requirement for DC chargers has increased exponentially. The biggest problem we see with DC chargers not operating correctly in caravans is installations with under-cabling, incorrect circuit breakers and connections from the auxiliary battery to the Anderson plug. All DC chargers require a minimum voltage input before they will start charging. This voltage is around 13.2v for standard alternators and approx 12.0v for smart alternators. Most DC chargers will work on a lower input voltage under load, but the output of the charger is reduced dramatically. The disconnect voltage will vary subject to having or not having a smart alternator. For non-smart alternators (Pre-2015) this voltage will be approx 12.6-12.8v. For smart alternator vehicles, this voltage will be approx 12.0-12.2v when operating. Most if not all DC chargers have their own VSR (Volt Sensing Relay) incorporated in the charger. If you have one of these, then there is no need to install a standalone VSR in the line from the vehicle. All this will do is switch on & off the charger when the voltage drops under load disconnecting the charger and when the voltage rises again it will reconnect the charger. This will interrupt the charging of your van batteries and possibly cause a reduced lifespan of your DC charger from continually switching on & off. 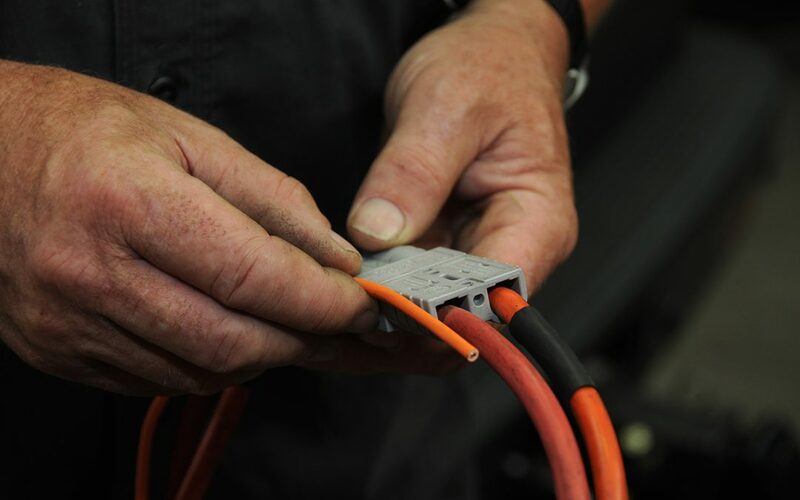 General installations of the DC charger cabling coming from the vehicle usually connects directly to the start battery, running through a fuse or high quality manual re-settable circuit breaker to an Anderson plug on the rear of the vehicle. The cable size can vary depending on length of cable run from the start battery to the Anderson plug and the amp rating of the charger used. The minimum size cable recommended for the majority of vehicle applications would be 6 B&S or 13-16mm2. This cable diameter will cater for chargers from 20A-40A. 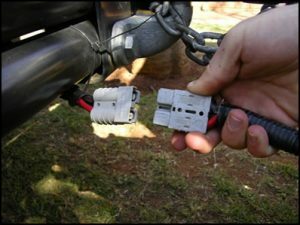 If you are operating a larger vehicle, say Dodge Ram or Ford F250-350, the distance between the start battery and caravan will be greater compared to a Toyota 200 Series Cruiser or Ford Ranger, so the cable diameter will more than likely have to increase to cover the extra distance. See the Enerdrive Cable Chart for correct cable sizing. It is also recommended that the Anderson plug cabling in the caravan is matched to the same size as the vehicle cabling or larger. This will guarantee that there is no “choke point” at the Anderson plug connection. This is a very common occurrence. We usually find in these cases with the charger operating; the voltage measured at the Anderson plug is significantly higher than what is measured at the charger terminals. The next big issue we see is circuit breaker installation. A lot of people fit the auto reset style of circuit breaker. This type of breaker is based on thermal trip rating. When you have electrical current flowing through a breaker, it generates heat. 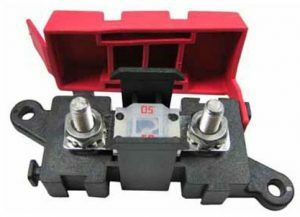 When the breaker is mounted in a hot engine bay, the breaker is also affected but heat generated in this space. With this heat and the heat of the electrical current flowing through the breaker, you will see early “nuisance” tripping of the breaker. The breaker will cool down and reset, but will only operate for a short period before it happens again and again. Basically the charger will be turning on and off consistently throughout your journey and not charging your caravan/camper trailer correctly. By installing a quality fuse assembly rated for the system, you can overcome this nuisance tripping issue. We also see vehicles fitted with auxiliary batteries along with the Anderson plug cables for the caravan charging connected to this battery in the tow vehicle. With vehicles running the smart alternators, they will have a DC charger feeding the auxiliary battery usually around 20A. So, if you have a 20A charger in the van, the DC charger in the vehicle will be supplying the charge to the van and not charging the auxiliary battery in the vehicle. By having the Anderson plug cable connected directly to the main start battery, the alternator will register the extra current requirement and ramp up to cover both DC chargers. For sizing of DC chargers, consulate the vehicle manufacture or an auto electrician to determine the correct amp rating to suit your vehicle application. Generally we would recommend a DC charger size of 50% maximum of the alternator output. (i.e. 80A alternator, 40A DC charger). The ePOWER DC2DC charger is fully adjustable on the Amp output. 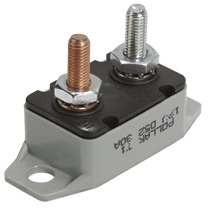 It can be adjusted from 0-50A in 5 amp increments making it extremely versatile. Just make sure you don’t exceed the capabilities of your alternator and the vehicles electrical system. The last thing you want to do is ring its neck and cook the alternator 500km from nowhere and then find out that smart alternator cost $3,000.00 to replace.